I am using a fun, FTU kit by Punky Butts called Irish Pride. You can find it HERE TYSM for the great kit! 1. Open new, 600 x 600. Click and drag tube of choice into the canvas. 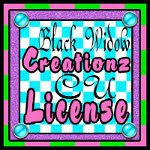 Add in copyright symbol, artist's name and URL as well as license if applicable. 2. Click and drag PSD template file into canvas. Delete copyright layer, Shape 5 copy 3 and Raster 5 layer. Link every layer of template in layers box together. Then click on top layer of template in layers box(shape 1) to activate, go over to the tools and click on Scale Tool and scale it down to 173 x 184. Everything else should scale down accordingly. Paper 5- duplicate to make 3 total, Original- will be mask (STEP 5). For the first copy layer, R click shape 5 copy 3 template layer in layers box, ALPHA TO SELECTION, L click on paper layer in layers box to activate layer, then go up to SELECT>INVERT and EDIT>CLEAR. For the last copied paper, repeat steps on shape 4 of template. Delete original template layer. Paper 6- duplicate to make 3 total, Original- R click shape 5 template layer in layers box, ALPHA TO SELECTION, L click on paper layer in layers box to activate layer, then go up to SELECT>INVERT and EDIT>CLEAR. Repeat the same steps with the frame layer of template and the first copied layer of paper. Repeat once more with shape 1 layer of template and the last copied layer of paper. Delete original template layer. Paper 10- duplicate to make 2 total, Original- R click layer 9 template layer in layers box, ALPHA TO SELECTION, L click on paper layer in layers box to activate layer, then go up to SELECT>INVERT and EDIT>CLEAR. Copied paper- repeat but with shape 6 of template. Delete original template layer. 3. Using the color pick tool, choose a purple shade off the tube. Right click on layer 8 of template ALPHA TO SELECTION, add a new transparent layer and fill with the purple shade. Repeat with layer 6. Delete original template layer. 4. Add drop shadow to elements and tube. Go to FILTERS>LIGHT & SHADOW>DROP SHADOW with settings at 2/2/6 for elements, and template layers. Use settings at 8/8/15 for the tube layer. 5. For mask, use paper 5. Click and drag mask into canvas, scale to 470 x 470. While mask layer is the active layer, flip it, then go up to COLORS>INVERT and TRANSPARENCY>COLOR TO ALPHA. Right click on mask layer, ALPHA TO SELECTION, activate paper layer, SELECT>INVERT and EDIT>CLEAR. Delete original mask layer. 6. For the text, I used a font called Hello Again in the same purple shade used prior, right click ALPHA TO SELECTION, SELECT>GROW by 2, make foreground color white and background color marigold hue. Use the blend tool with linear as the shape, add a new layer and drag upwards. This sometimes takes a few tries. Add noise to this layer by going to FILTERS>NOISE>RGB NOISE with settings at 20/20/20/0 and correlated checked only. Add drop shadow to this at 2/2/6.